* Off the top, I get booze (maybe cognac or rum) sweetened with vanilla. * It is also creamy and a little rubbery, which might be a floral also in the mix. * The alcohol burns off and a sweet tobacco and the creamy floral go more creamy almond. At this point a cherry note starts to appear with a light bit of incense. * The creamy almond gets sweeter and more honeyed, transforming into caramel and vanilla. The cherry note gets stronger with the incense staying as well. * The long-lasting base is woody incense with caramel resins and a hint of the cherry still in there. People of the Labyrinths is a Dutch clothing and furniture line with eccentric styles that aren’t inexpensive. I looked up the phrase Luctor et Emergo and it comes up as motto of the western province of the Netherland, Zeeland, which means to struggle and win. I am not sure how this scent represents that, as it it more representative of vices leading to sweetness. Maybe its the conquering of vices for a sweet and religious victory. Ok, I am reaching there. Let’s just say this is a great nighttime scent for adventure and fun. Longevity is excellent with the base lasting overnight and through to the next day when you shower it off. It’s one of the scents that I kept sniffing myself to enjoy. I could see myself buying a bottle as a souvenir the next time I am in Amsterdam and realize that I probably can’t afford any of the wild clothing at their fun boutique right off the luxury PC Hoofstraat street. 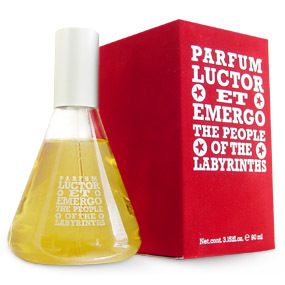 Luctor et Emergo is available from Olfactif and Luckyscent. Disclaimer: Sample came from an Olfactif sample set. Picture courtesy of LuckyScent.